Listen Here: Winter Playlist 2015 from lgpq on 8tracks Radio. 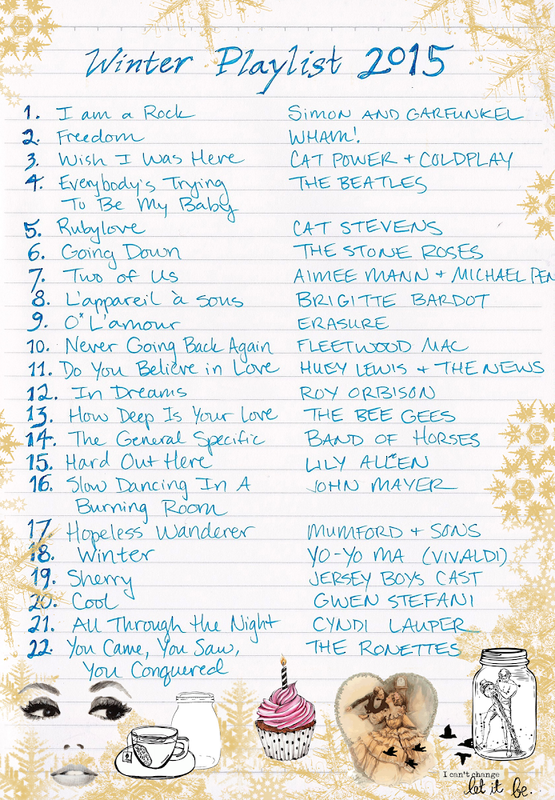 Winter playlists tend to be my most surprising. And maybe that's because my winters tend to be full of surprises. My birthday falls mid-way through this season, and big life changes always seem to coincide with it. I wonder what this year will bring? It's never quite predictable, but it's always something fascinating. In true Aquarian fashion, my music taste is likewise unpredictable (unless, of course, you know me -- in which case this playlist is probably just what you expected!) Still, it's not everyday that you'll find Cyndi Lauper, Mumford & Sons, and the cast of Jersey Boys vying for space in one lady's heart. I like to think this indicates my tolerance of all different kinds of music; in truth, it probably just goes to show I like songs, not bands. What's coming through your headphones this winter? I haven't assembled a playlist for this season yet, but I have found myself listening to a lot of the music I listened to at the start of high school/discovering music from that time period that I missed. I've been listening to a lot of early Camera Obscura (mostly stuff from their EPs, like the "I Love My Jean" EP and the EPs they released around the time of "Let's Get Out of This Country"). I've also been listening to the first Clap Your Hands Say Yeah! album (which I remember hearing a lot about when it came out but for some reason never listened to until now), "Lola Stars and Stripes" by the Stills, and "You Got Me" by VHS or Beta (which I remember listening to endlessly as a freshman). I'm not sure what brought about this wave of nostalgia for the mid-2000s, but I've been enjoying revisiting the music from the time period in my life when I first started really getting into music. And I have to say, I think the whole '90s revival in music has more than run its course and it's time to bring back the tunes of the Aughts. Who's with me?? Rediscovering music that informed a specific time in my life is something I’ve always enjoyed. One of my favorite things to do in iTunes is sort my music by the “Date Added” category, and re-experience a particular chapter of my life. Music, like scent, has an incredible ability to preserve feeling, to take us back to a moment in time. It’s something I’ve always found comforting. Be sure to share a link to your playlist, if/when you make it! I always love seeing other people's take on the season.